Your AYP lawn mower spindles are needed to ensure the blades spin properly underneath the mowing deck. Replace the spindle shaft, spindle housing, or spindle assembly if they are bent or broken. 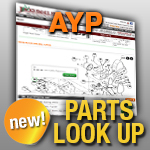 Match your model or part number below to find compatible spindle parts for your AYP lawn tractor.